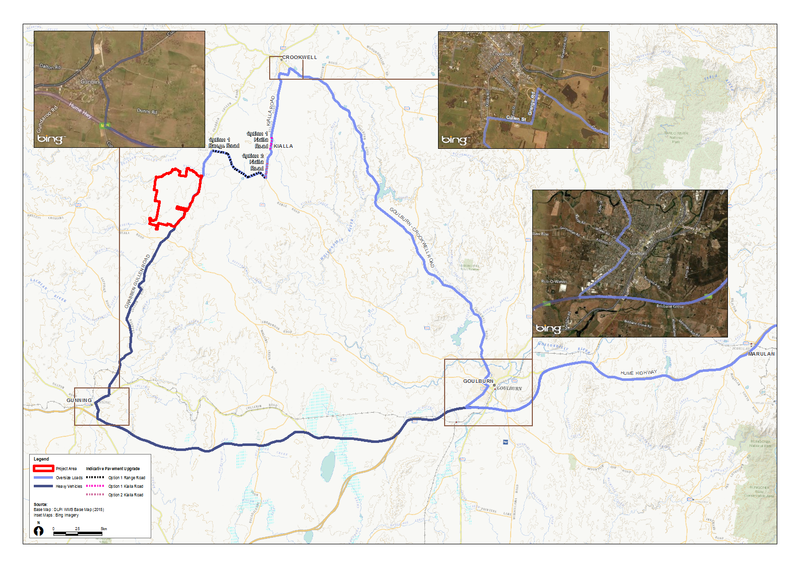 The proposed Biala Wind Farm (the Project) is located approximately 8km east of Biala and 14.5km south west of Crookwell in the Southern tablelands of NSW. It is owned by Beijing Jingneng Clean Energy (Australia) Holding Pty Ltd (BJCE Australia) who also owns the nearby Gullen Range Wind Farm and Gullen Solar Farm. The wind farm is expected to have an installed capacity of approximately 110MW, producing enough electricity for approximately 46,000 typical homes on an average day of wind. Wind turbines – 31 wind turbine generators (WTGs) with a maximum height of 185m (ground to blade tip). The turbine towers will be connected to concrete foundations buried in the ground. There will be a small electrical transformer located next to each turbine. Access tracks – the locations of the turbines will be linked by gravel tracks. Each turbine location will also include a gravel area to setup the cranes used to lift the turbine components. Electrical cables – turbines will be linked by an underground 33kV electrical cabling and fibre optic communications cabling. Meteorological monitoring masts – up to three masts will be constructed to enable monitoring of wind speed and direction. Ancillary facilities – a maintenance and storage shed will be constructed together with a site office and car parking facilities. Substation/switchyard – it is currently not planned to build a new substation at Biala Wind Farm but instead connect to the existing Gullen Range Wind and Solar Farm substation/switchyard via an underground electricity cable. Use of the existing Gullen Range Wind and Solar Farm infrastructure avoids the impact of constructing a new substation. A minor extension to the existing substation will be required to accommodate the additional energy from the Biala Wind Farm. Transmission Line – in order to transmit energy from Biala Wind Farm to the national electricity grid, we propose to construct a 12km underground 33kV transmission line between Biala Wind Farm and our existing Gullen Range Wind and Solar Farm substation/switchyard. In order to minimise environmental impacts and the ability to farm the land, the transmission line will be placed underground. You can find out more about the transmission line here. You can view the location of the proposed wind farm here. BJCE Australia acquired the Biala Wind Farm from Newtricity Developments Pty Ltd (Newtricity) in October 2017. Newtricity submitted an application for development approval for the Wind Farm in 2015. Development Approval (Consent) was obtained from the NSW Planning Assessment Commission on 12th April 2017 and can be viewed here. The Development Consent was granted under the provisions of section 89E of the Environmental Planning and Assessment Act (1970). For details of other documents considered by the Department of Planning and Environment (DPE) when the wind farm was approved, please visit the DPE website by clicking here. The Development Approval for the wind farm does not include the infrastructure required to connect to the electricity network. A development application was submitted to Upper Lachlan Shire Council in November 2017 for an underground 33kV electricty connection to the existing Gullen Range Wind and Solar Farm substation. An extension to the Gullen Range Wind and Solar Farm substation is part of this application. The development application was approved by the Southern Regional Planning Panel (JRPP) on 17th January 2019 subject to conditions. The approval and conditions were subsequently issued by the Upper Lachlan Shire Council. Further information is available on the Planning Panel’s website here, including the documentation submitted by Biala Wind Farm. The Development Approval issued by Upper Lachlan Shire Council can be downloaded here. You can find out more about the transmission line here. BJCE plans to begin construction of the wind farm in 2019, with electricity being generated in the first quarter of 2020. The Development Approval defines the transportation routes to be used during the construction phase. Oversize loads will be transported to site via Goulburn and Crookwell, while other heavy goods will travel from the Hume Highway via Gunning. You can download a map of the routes here. Please note that the ‘pavement upgrade’ options labelled on the map will be completed. We will be developing a detailed traffic management plan, which will be available here when it has been agreed with Roads and Maritime Services (RMS) and Upper Lachlan Shire Council.